Vacation rental lodge. Sleeps 31, 6 bedrooms, 6.5 bathrooms. No pets allowed. NEW CUSTOM vacation home located in beautiful Tierra Linda where you can enjoy the hills and vistas of the Frio River Valley! With it’s spacious open concept floor plan, this tastefully furnished modern rustic/farmhouse style home offers 6 Bedrooms (18 beds), 6 ½ bathrooms to accommodate up to 31 guests, where 5 of the bedrooms have NO BUNK BEDS (bedroom 3 is a bunk room)! Each bedroom has private entry and attached private bath! Five of the bathrooms have a large, tiled walk-in shower, while bedroom 5 has a bathtub/shower combo. This is the ONLY 6 bedroom, 6 ½ bath and LARGEST SQUARE FOOTAGE vacation rental in the Tierra Linda Subdivision! 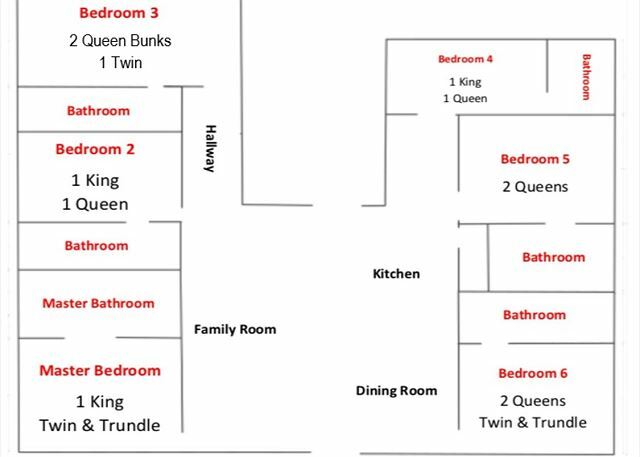 The Home Owners put as much thought in the layout of the home as they did in naming it! An amazing outdoor space is the crown jewel of this home! Outside you will find a Large PRIVATE SPORTS POOL with volleyball net and 4 ft. X 8 ft. sundeck for toddler play or sun tanning, Horseshoe/Washer Pit, Tether Ball, Large Covered Porch, Firepit, BBQ Pit, ½ Bathroom, LARGE Outdoor Kitchen with granite countertops, Extra Refrigerator, Flatscreen TV with satellite! Inside you will find stainless kitchen appliances, Refrigerator/Freezer, Washer/Dryer, Fully Equipped Kitchen (microwave, dishwasher, blender, coffee maker, toaster, griddle, and crockpot), Guest Pantry, Higher end Granite counter-tops throughout, Flatscreen TV with Dish Satellite, Wi-Fi, Fireplace, and AC/Heat. Minutes away from the Frio River, House Pasture Cattle Company Restaurant and Texas Music Venue, and Concan Country Club! Easy access to the Frio River, which is just over 1 mile to either the Kenneth Arthur or Seven Bluffs crossings! FREE RIVER ACCESS at Frio Country Resort (Kenneth Arthur Crossing) for guests staying at Chula Vista! Beds will be made, just bring your towels! Ask for Discount Code at check in! • ABSOLUTELY NO PETS allowed. Chula Vista was everything could every ask for! Excellent service, very clean, full of Wonderfull amenities.